ARE you right-handed? Perhaps you only think so. There is one chance in ten that you are ambidextrous, or “two-handed,” without knowing it. If you are, you can learn to use your left hand as well as your right, and immeasurably increase your efficiency in work and sports. Tests recently conducted by Dr. Thaddeus L. Bolton, head of the department of psychology in Temple University, Philadelphia, definitely confirmed earlier estimates that twenty percent of all people are ambidextrous. The experiments also brought out the striking fact that half of that number are unaware of it. One of the tests is so simple that you easily can make it yourself. It is the wand-twirling test, designed to ascertain the learning capacity of the left hand. Both hands are given an equal amount of practice in twirling a light wooden wand, or stick, as a drum major twirls a baton. If you believe yourself to be right-handed, begin by twirling the wand to the left in the fingers of the right hand. Do this for, say, three minutes and make careful note of the number of successful twirls you accomplish. Then do the same exercise, for the same length of time, with the left hand, twirling the stick to the right. Again, note the number of successful twirls. Repeat both exercises half a dozen times. The left hand will begin showing a lower average of successful twirls and remain lower throughout the test. Now reverse the process. In the exercise with the right hand, twirl the wand to the right, and in that with the left hand, twirl it to the left. If you are decidedly right-handed, your right hand will surpass your left, as in the first test. But if yours is a case of suppressed left-handedness, your left soon will outstrip the right, and keep its lead. TO CHECK up on this experiment, Dr. Bolton, in his tests, inverted the order of the exercises. Taking a fresh subject, he had him do the second experiment first, and the first, second. In students with a tendency to left-handedness, the left hand showed supremacy from the start. Three other tests preceded the wand twirling experiment. First, Dr. Bolton measured the strength of the two hands of each of his subjects with an instrument known as a dynamometer. On this apparatus the stronger hand registers the higher mark. Then he determined speed and coordinated motion with a tapping test in which the rate of tapping for a certain length of time by both the right and left hands was recorded. 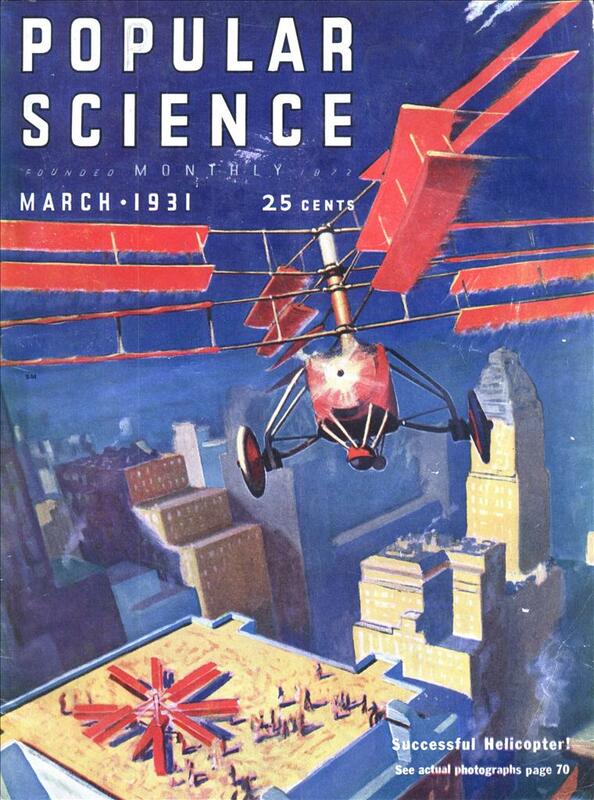 The third experiment was designed to ascertain steadiness of motion. To do this, the psychologist used a device consisting of a number of parallel brass bars set at different distances from one another. The students were told to pass a stylus, held first in the right and then in the left hand, from left to right and from right to left, through the intervals or openings between the bars, and to try not to let the stylus vibrate either up or down and thus touch either bar. When vibration occurs, an electrical contact is made and a bell rings, the number of rings establishing the ratio of unsteadiness. Hundreds of Temple University students, both men and women, were subjected to these tests. Sixty-five percent were shown to be definitely right-handed. Fifteen percent were decidedly left- handed. The remaining twenty percent were ambidextrous, but only half of them knew it. This ambidexterity varied in degree, for “two-handedness” does not always mean exact equality of both hands. If you perform most of your tasks with the right hand and yet possess a left hand of considerable skill, you are ambidextrous. “The real value of this work,” Dr. Bolton told me the other day, “lies in its possibilities when applied to children. All public school pupils after they have reached the sixth grade and begun to show occupational and professional preferences should be tested. “The tests would prevent attempts to train young persons in specialized two-handed work if they are not suited to such tasks. Certain types of employment, such as typewriting, operating typesetting machines, and piano playing require a high degree of ambidexterity. Dr. Bolton’s theories differ sharply from those of Dr. P. Armaingaud, of the French Academy of Medicine, who, in a recent lecture before that body, suggested that children be trained to write with both hands. The habit of using only one hand, he declared, is ridiculous, needless, and obsolete, and any adult, with several months’ practice, can make his left hand as useful as his right. DR. BOLTON says it would be difficult to do this, as the relationship between the two hemispheres, or halves, of the brain and the two hands is hard to change. A right-handed person is left-brained, meaning that the left half of the brain leads in all action. A left-handed person is right-brained. This accounts for the circumstance that a right-handed person also is right-eyed, right-legged and right-footed; in fact, his entire right side is developed a little more strongly and is a little larger than his left side. In a left-handed person, the opposite is true. When a right-handed person uses his left hand, he probably uses his left brain working through the right brain, instead of the right brain directly. But if he is to be made permanently left-handed, he also must be made right-brained. In this connection, the psychologist told me that there is no direct relationship between “handedness” and intelligence. In other words, left-handedness in a child is no more a sign of backwardness than right-handedness is a symptom of brightness. The belief that there is such a connection is due to the fact that some backward and feeble-minded children happen to be left-handed. THIS belief is chiefly responsible for the widespread prejudice against left-handedness, which has survived even among educated people. Dr. Bolton told me he receives a surprisingly large number of letters from teachers in various parts of the country, complaining that they lack the authority to “break pupils of left-handedness. “They write me that the parents don’t seem to care much,” said Dr. Bolton, “and I tell them the parents are right. There is little occasion for changing left-handed people to right-handed people. Left-handed writing is just as fast as right-handed, and in almost all instances it is just as easy to read. “As a matter of fact, left-handedness even has some advantages, particularly in sports. As everyone knows, a good ‘southpaw’ pitcher in baseball is invaluable because he confuses the opposing batter. Many of our greatest diamond stars were and are left-handed. Babe Ruth is the greatest left-handed slugger of all time and once was a brilliant southpaw pitcher. ‘Lefty’ Grove of the Philadelphia Athletics and Pipgras of the New York Yankees are other examples. In football, too, some advantage is gained by a team that has a man playing a left-handed tackle or a left-handed guard to the confusion of the opposing eleven. “Most left-handed children feel superior to their playmates. The reason is that they can do something—for example, writing with the left hand—that the others can’t. They have a specialty. This tends to make them independent and self-reliant. Persons who generally use the right hand but prefer to perform certain tasks such as, for instance, handling the cue in billiards, with the left, are cases of suppressed left-handedness, according to Dr. Bolton. Such people, he says, can train themselves to be ambidextrous without undue effort. What produces left-handedness? The primary cause of left-handedness is the tendency of our brains and bodies to depart from a strict symmetry, or balance. This lack of symmetry manifests itself in a larger brain hemisphere on the left accompanied by a slightly larger body development on the right side, or in a larger brain hemisphere on the right with a slightly larger body on the left. THAT these differences exist has been established by careful measurements of left-handed and right-handed persons. But the matter still is very much in the guessing stage. Some weeks ago, two investigators of the University of Chicago, Loh Seng Tsai and Siegfried Maurer, succeeded in making a number of right-handed white rats left-handed by feeding them a diet lacking in vitamin B. In these experiments, the rats, after having been deprived of vitamin B for a certain period, were fed from long-necked bottles. Rats, it appears, eat with one paw. Those formerly right-handed stuck their left paws into the bottle necks. One hundred male and one hundred female rats were used in the tests. Of the males, sixty-nine were right-handed and thirty-one left-handed before vitamin B was denied them. Afterward, exactly half were left-handed. 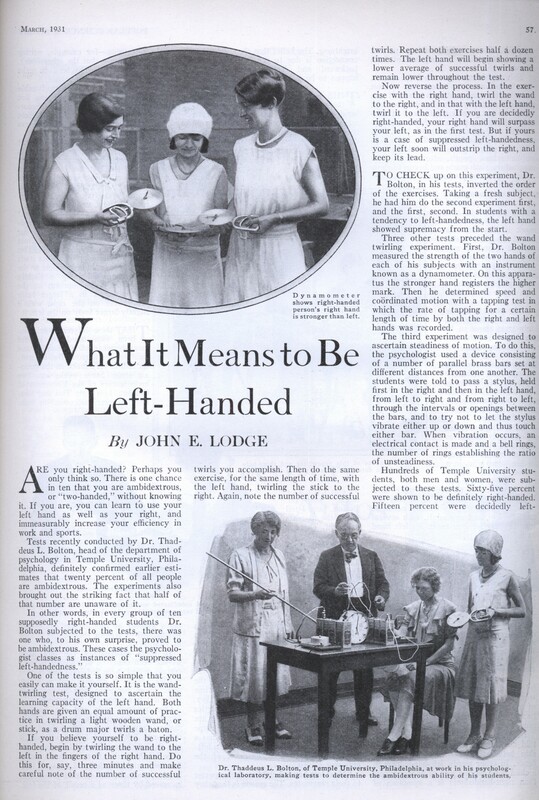 Of the females, fifty-four were right-handed and forty-six left-handed, and the left-handed group was increased by three as a result of the test.